Combative Edge (Martial Arts Cross Training) STAND-UP/CLINCH/GROUND. This Class includes Striking (Padwork) Clinchwork (Upright Wrestling) Goundwork (Grappling/Locking). Darren Robbins is a well accomplished martial artist, he has trained in Martial Arts for over 25 years in many styles including, Western Boxing, Judo, Jun Fan Gung-Fu Jeet Kune Do, Filipino Martial Arts (Weaponry & Empty Hand), Indonesian Martial Arts(Weaponry & Empty Hand), Thai/Kickboxing, Jun-Fan Grappling, Brazilian Jiu-Jitsu. 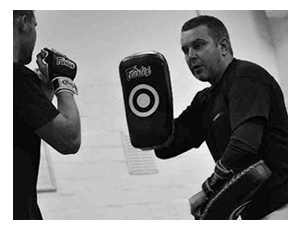 Over the Years Darren has trained with some of the finest Martial Artists from around the Globe & hosts regular Guest Instructor Seminars/Workshops at Wossobama Gym.